Cañada College has launched its fourth annual Jacket & Toy Drive! The donations for this year’s drive will be benefit families in Redwood City. 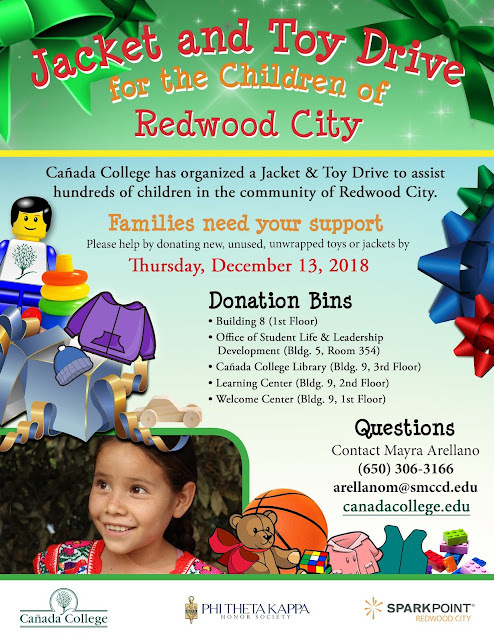 Last year’s Jacket & Toy Drive generated more than 300 donation items for hundreds of families and we are looking to grow the number of donations this year! For questions, please contact Mayra Arellano at arellanom@smccd.edu or x3166. Thank you, in advance, for your support in this year’s Jacket & Toy Drive!